The program is scheduled to be aired on September 10, 2016 (Saturday) 9:30AM, it will be re-broadcasted on Thursday, 11.05AM. Both times for the program are according to Japan Local Time. This program will be featured on NHK World Premium (For Overseas Broadcasting). It is also scheduled to be aired on September 10, 2016 (Saturday). Please visit NHK World Premium Website for more details on broadcasting times. As officially announced on the Ki Society Website, Koichi Tohei Sensei passed away peacefully on the 19th of May 2011 (Thursday) at 9:14 am. He was 91 years old. We sincerely appreciate those who kindly assisted and supported Koichi Tohei Sensei when he was alive. The private funeral was held with close family and relatives. The public Farewell Reception hosted by Shinshin Toitsu Aikido Kai (Ki Society H.Q.) 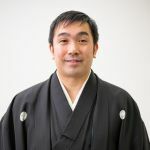 will be held on 17th July 2011 (Sunday) at the Tsukiji Hongan-ji Temple in Tokyo. For the details of the Farewell Reception, please refer to the following information and Frequent Answers and Questions. Date and Time: 17th of July 2011 (Sunday), Afternoon: 1:00 pm – 2:30 pm. Public traffic congestion is expected on the day, therefore, please refrain from visiting by cars. Q1. Is it possible for non-members of Ki Society to attend? A1. Yes. Everyone can attend. Q2. What is the preferable dress? A2. Probably many people wear semi-formal dress (dressed in black). Q3. With what religion will the Farewell Reception be held? A3. It is held in non-religious style. Q4. Do you accept floral tribute? Q5. Is there car park? A5. Yes, however, we prefer you to come by public transport facility due to expected traffic congestion. Q6. How many seats are there? A6. There are approximately 1,000 seats inside facility. If there are more of visitors, they may not be able to go inside and probably need to wait for paying floral tribute. Kagamibiraki at Ki Society H.Q. Ki Society H.Q., of which I am a president, held the “Ki Society H.Q. Kagamibiraki” on 9th January 2011 (Sunday) at Ki Society H.Q.(Sohonbu). Kagamibiraki is the most important event held at Ki Society H.Q. and many instructors gathered from all over Japan. In the early morning, with temperatures at four degrees below zero, we have purified both our mind and body in the cold water basing training (Senshin no Gyo). Kagamibiraki (Opening of the new big Sake bottle) was held and the Sake and Zouni (rice cakes boiled in vegetable soup) were served thereafter. And then, Syugyo Tassei Kigan Shiki (The ceremony praying for success in our training)” was held, I offered a prayer wishing the whole members of Ki Society in the world the successful achievement and safety of their training through the year. I took charge of teaching in the first training just after the above ceremony. The activities of Ki Society H.Q. has begun officially subsequent to the completion of Kagamibiraki. The following is the members who were promoted by the year’s recommendation. On 1st August 2010 (Sunday), the 29th All Japan Shinshin Toitsu Aikido Taigi Competition was held at Tenshinkan Dojo, at Ki Society H.Q. This time, approximately 200 players, who represent dojos, classes, schools and universities from all over Japan, have participated. There is no effort to overcome others in Shinshin Toitsu Aikido. In this competition, players perform a series of techniques that is called Taigi. The Taigi Competition judges the depth of mind and body unification maintained while performing the series. With a clear state of mind and body unification, posture is stable, natural rhythm is produced, and the techniques become large. *If Nage is under 40 years old, the pair performs in Adult division (Under 40) and if Nage is 40 years old and above, they perform in Adult division (40 and above). Uke does not have age limitation in these two divisions. Prize winners’ names (without Mr. / Ms.) and their branches, universities are as follows. Congratulations. This competition was made possible with the kind cooperation, support and donations from many people. I would like to extend my sincere appreciation to those contributors. Thank you very much. Ki Society H.Q., of which I am a president, held the “Ki Society H.Q. Kagamibiraki” on 3rd January 2010 (Sunday). In the early morning, with temperatures at two degrees below zero, we have purified both our mind and body in the cold water basing training (Senshin no Gyo). Kagamibiraki (Opening of the new big Sake bottle) was held and the Sake and Zouni (rice cakes boiled in vegetable soup) were served thereafter. 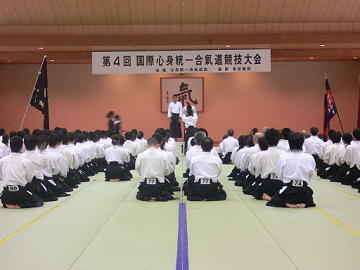 The main event of Kagamibiraki is “Syugyo Tassei Kigan Shiki (The ceremony praying for success in our training)”. In this ceremony, I offered a prayer wishing the whole members of Ki Society in the world the successful achievement and safety of their training through the year. Afterwards, the recommended Dan promotion was announced and I awarded these certificates to the respective members. The following is the members who were promoted by the year’s recommendation. I took charge of teaching in the first training just after the above ceremony. The photoes were taken after the training. 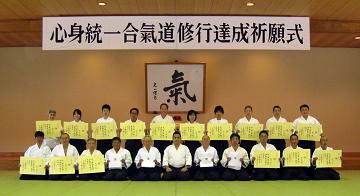 On 26th July 2009 (Sunday), the 28th All Japan Ki-Aikido Taigi Competition was held at Tenshinkan dojo, in Ki no Sato. This time, approximately 200 competitors, who represent dojos, classes, schools and universities from all over Japan, participated. There is no game in Ki-Aikido. In this competition, competitors perform a series of techniques that is called Taigi and compete the level of depth of mind and body unification. With the state of mind and body unification, the stable posture can be maintained, natural rhythm is produced, and the techniques become large. * If Nage is under 40 years old, the pair performs in Adult division (Under 40) and if Nage is 40 years old and above, they perform in Adult division (40 and above). Uke does not have age limitation in these two divisions. This competition could be held with kind cooperation, support and donations from many people. I would like to extend my sincere appreciation for those. Thank you very much. The highest award is given a team which participated all 4 categories and got the highest average among all divisions. This year was International competition which is held every four year. Participants came from the US, Russia, Australia and of course Japan. This is result of 27th All Japan Ki-Aikido Taigi competition which was held on July 28th and 29th, 2007. I will tell you name of recipient of a prize in following order: Under 18 Division, University Division, Adult Division. The most superior special prize is given a team which earned highest average score in Elective Taigi, Elective Taigi(weapon), Kengi, Jogi. Congratulations to recipient of a prize! 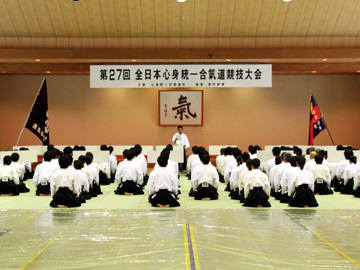 4th International Ki-Aikido competition will be hold June 28 and 29, 2008. Overseas members will also participate. Let’s join us those who study Ki-Aikido!